Voice teacher, born 1971 Italian and French, previously contralto and mezzosoprano soloist in opera, oratorio, lieder. I was dedicated to an acting career and student winner of a scholarship at Accademia Internazionale di Teatro in professional courses 1994/95 while following the courses of popular music with Giovanna Marini, ancient music, vocal improvisation with Antonella Talamonti. I entered the Conservatorio A. Casella in 1997. In 2000 I started a soloist professional career. I recorded the credits for Michele Placido movie Un viaggio chiamato amore in competition at 59th Mostra Internazionale of Venezia, I was the alto soloist in J. S. Bach Magnificat for the “Concerto per la vita e per la pace” of Christmas 2003 worldwide broadcasted by Raitv, for Anna Cuocolo in prestigious Festival di Andria and Teatro Marrucino, Festival Frentano, Teatro comunale dell’Aquila, Società dei concerti B. Barattelli, Orchestra sinfonica abruzzese, Festival di Anagni, Corso per organista e maestro di cappella_l’Aquila, Auditorium YMCA Jerusalem, Teatro Vascello Roma, Teatro dell’Unione Viterbo and many others. The career abruptly lasted in 2004 for an abdominal medical condition worsened by a surgery malpractice (the surgeon was convicted for malpractice and for causing the end of the career). I started teaching during the septicaemia that lasted six years and probably part of the discoveries for my method would have not been possible without that extreme level of general inflammation, for some years also chronic and neuropathic pain. With a doctor we made the hypothesis that I could feel and realise what parts where involved and the connections I found by this extreme and pathologic sensitivity. So it was really unlucky but fortunately not only unlucky. 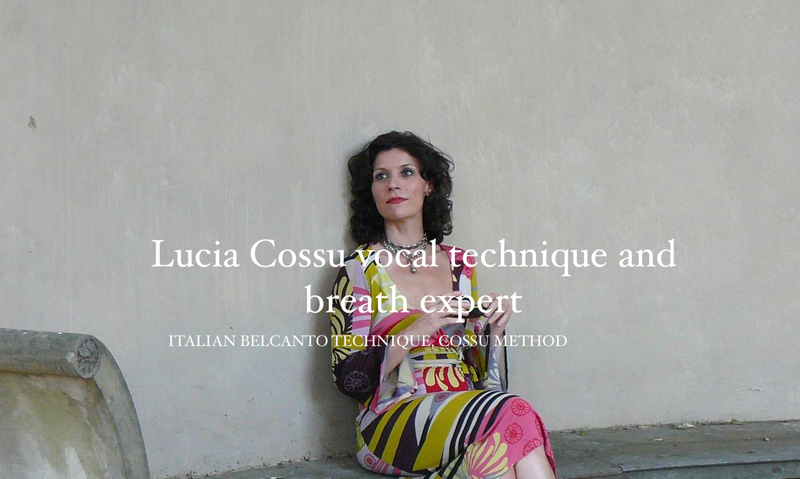 I developed the precise exercises I call now Cossu method has a further step of principles of Italian belcanto technique I was trained in. It seems a reasonable hypothesis that those exercises work on the muscular chains strictly related to what is a healthy and well coordinated voice production, viewed the kind and charachteristics of results in applying it (so at the end I was instead probably profoundly lucky, even if harsh). It is now something as a corpus of 50 exercises, some completely created new, some modified from yoga or dance or theatre training and a certain number of vocalises that get more precise every year. What is beyond expectancies was to discover that when you connect properly those muscular chains the voice will seem to have functioned naturally since always, the sound of the chords changes immediately and go on developing for the successive year; to be sure of what I was really doing I made a precise program under medical control on some cases with nothing or damaged vocal chords with nodules, hypomotilities, an organic damage, disphoniaes, deficiencies in adduction not solved with medical treatements. I had not the right to see or to know of medical certifications, the results were of the suspect of having really found something new and useful. The improvements in sound, extension, not straining of the voice anymore and career, also without medical certifications are in the same line of those certified and constant. Since I worked with pop and contemporary voices I started adapting vocalises from Garcia or Panofka or Marchesi or my teacher Giannella Borelli in accents and vowels and muscular balance to have them useful for not classical sounds and also the results in young singers and professionals were what you can see in my upper pages. It happened to work often with teen and preteen and it is a kind of work I am fondly passionate about, being complementary to the work with professionals. On one side you have to work and adapt to a style yet structured (or some real bad habits) and find the part not yet expressed that will give a flavour or more flavour of them in the present, on the other it gives the possibility of having more time to really develop well an instrument discovering how the world is evolving and the musical potential of a human being and an interpreter of the future and adapting my tools to become their sounds being the future sounds. I studied with Giannella Borelli, Anna di Stasio, Giovanna Canetti, Angelo degli Innocenti, Cesare Scarton, Giovanna Marini, Antonella Talamonti and followed seminars and masterclasses with Charles Spencer, David Jones, Cinzia Spata, Franco Fussi, Gretchen Parlato, Ilse Middendorf therapists, Cathrine Sadolin. My collaborations have been with Carlo Crivelli, Jonathan Williams, Lorenzo Arruga, Anna Cuocolo, Sergio Rendine, Cesare Scarton, Simone Genuini, Angelo degli Innocenti, Claudio Curti Gialdino, Francesco Sorrentino, Vittorio Antonellini, Luciano Bellini, Giorgio Carnini, Anna Cuocolo, Diego Conti, Angelo Manzotti, Sergio la Stella, Toni Candeloro, Federica Carnevale. My repertoire was of a certain variety: opera, chamber music and oratorio, lieder. The technique was good enough to have high-notes that permitted me to sing some pieces out of the ordinary alto repertoire such Wagner’s Wesendonck Lieder and Carlo Crivelli and Luciano Bellini’s pieces, written for a soprano tessitura. One of my charachteristic was the obsessive work on sound, the research of the sense of fraseggio and music laying into the work on sound in itself and its overtones and nuances. Grazie, son felice lo trovi interessante. Ciao a te. Mi piaciono tuti gli cose che sta faciando lucia, sono securo che i tuoi studenti sono fortunati di avere una professoressa come te. cara Lucia ti ho trovata anche qui, e sono felice di conoscerti. Bella pagina interessante. Un abbraccio.